On the continuing theme of using fresh strawberries, I am delighted to share my new version of my Big Fluffy Pancakes recipe with the addition of fresh fruit, oatmeal and a bit of complementary spice! Butter and maple syrup are of course wonderful on these strawberry oatmeal pancakes, but if you really want to wow your loved ones, try topping this with real whipped cream and a drizzle of ginger citrus syrup! Serves 2 – adjust as you need. An easy way to use fresh strawberries for a delicious breakfast! The ginger and the strawberry go together well, and complement each other – for a fun twist, add some diced candied ginger when you add the strawberries. First, put the oatmeal in a small bowl and add the milk. Let it sit for a few minutes to let the oatmeal absorb some of the milk and go soft. In a large bowl, sift together the dry ingredients: flour, baking powder, salt, ginger and sugar. If the mix is too runny, you can add flour by spoonfuls to get it to a nice texture. Heat a griddle to medium-high heat, adding butter to the griddle is an optional step. Pour about ¼ cup batter for each pancake onto the hot griddle. 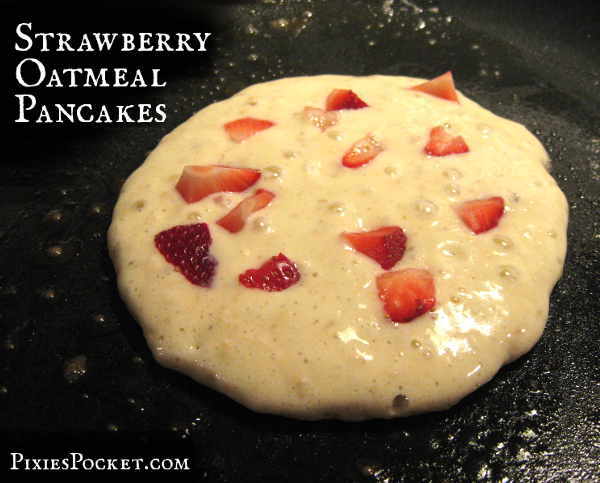 Sprinkle diced strawberries onto the pancake. Let it cook until the edges begin to solidify, and bubbles start appearing in the middle of the pancake. Flip and cook for another minute or so. Remove from heat, and serve hot! Did you try it, Karen? 🙂 I hope she likes them! I have a serious ginger addiction! I put it in LOTS of things. 🙂 Enjoy!